snowdeal.org > ex machina: the eric update - day 1230: the most super awesomest tree swing. EVAR! the eric update - day 1230: the most super awesomest tree swing. EVAR! odin loves to swing and we happen to have some nice pines in the backyard just begging for a tree swing hanging off them, so i found a tutorial on how to build a tree swing that looked like it would do the trick and set out upon the task. 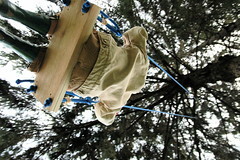 i beefed up the hardware and rope specs to make sure it was suitable for adults of all sizes, hung it off a branch that's about 25 feet ( 7.6 meters ) in the air and made the seat easily adjustable so you can quickly switch between kids who are 3 feet tall and those that are, say, over 6 feet tall. you might recall from beginning math, that a circle with a radius of 25 feet with carve out quite an arc - without too much effort you can get the swing going on a 30-40 foot glide path! needless to say, it's a big hit with the neighborhood kids. and their parents.